Biting is a frustrating and painful stage of puppy development, but however fierce your puppy may sound, and however hard he bites, it is usually just playful and normal puppy behaviour. Puppies bite more if they are excited. The more excited they get, the harder they bite. Any kind of contact with you, or other members of the family, including physical contact, talking, shouting, even eye contact, all reward your puppy. Your puppy has been learning to inhibit his bite since he was tiny. His mother and brothers and sisters taught him how hard he could bite without hurting them. But you need to teach him that the bite your puppy used on his mother is too painful for delicate human skin. At 8 weeks old: your puppy’s bite is not quite as powerful as it will be in a few weeks, but those teeth are still needle sharp. And in 12 weeks’ time those bites will be hurt a lot more! So how do you teach your puppy not to bite? Make sure your puppy has a place to call his own – this may include a crate and an area which can be used to confine him – a play pen is ideal. This should be made into a really nice place for your puppy to be. Make sure he finds favourite toys, treats and a cosy bed. When you cannot supervise children with the puppy, use the pen to separate them. When your puppy gets over-excited, put him in his pen for a short period to calm down. It is very important that this is not used as a punishment; your puppy should choose to go into his area when he wants to rest. While puppies need to play, and explore their world – letting him get over-excited is not productive. One of the key things to teach your puppy is to calm down. You need to recognize when he is getting over-excited and ‘break up’ the game – this might be with a toy, an adult, a child, or another dog. A puppy’s favourite reward is your attention. When your puppy bites, remove your attention immediately, stop any game you were playing. If he persists in trying to get your attention – pop him in his space – wait about 10 seconds, then go back to him. Repeat as necessary. You may have heard that a puppy will stop biting if you yelp or squeal. But in my experience, most puppies get even more excited by the yelping, and on others it has no effect. The strongest signal you can give your puppy is the loss of your presence and attention. Many puppies see fingers and toes as something to chase and play with. Instead of wiggling fingers and hands at your puppy – use toys that he can tug and bite on. Teach him to give and take toys politely. Teaching an ‘enough’ or ‘finish’ cue before you stop the game, will teach him to learn self-control. (This are things a good puppy class or trainer will teach). 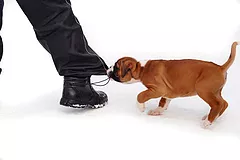 If your puppy has a fascination for your feet, wear thick shoes that protect your feet from his teeth – avoid laces as these really are fascinating. I often suggest to my clients that they wear (clean) wellingtons around the house! These will allow you to stand still and ignore your puppy until he gives up and finds something else more interesting. If your puppy regularly nips at your hands when you go to pick him up when he is getting overexcited, you can put him in his harness* and attach a houseline so that you can pick up the end of the line and move him to where you want him to go without his grabbing at your hands. Never leave your puppy unsupervised when wearing a houseline as he may get tangled up in it and cause himself an injury. Never attach a houseline to a collar as it may cause injury to your puppy’s delicate neck area. For the same reason, do not grab and pull on his collar. – Move your hand a little way towards the puppy. – If he does go for your hand, you are too close so move further away from him. – Gradually move your hand closer to your puppy, rewarding him for not moving his mouth towards it. – Build this up slowly so that you can touch him anywhere on his head or body, pick up his paws etc. All without him grabbing or mouthing at you. As puppies grow older, biting can reappear. Puppies between six and nine months of age, are extremely boisterous, and may start nipping with their teeth during play. Safe toys such as balls, tuggies, frisbees; or activities such as agility, find it, tracking etc. will stimulate your dog both mentally and physically and prevent your dog using parts of your body as his play things. Rough and tumble should always be discouraged, especially with children. The first step in this process is to protect any children you may have, or that visit and play with your puppy. 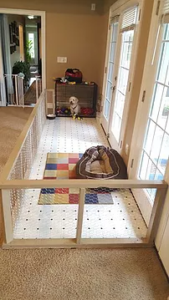 – Baby gates allow you to separate children and puppies when you are not free to supervise. – Do show children how to stroke your puppy gently whilst you hold one end of a chew and let the puppy gnaw on the other end. – Hands are a particular target for puppy bites, so teach your children to interact with your puppy using appropriate toys. – Do make sure that children don’t get the puppy excited or run around squealing whilst he chases them. It will end in tears. Punishment has no place in puppy or dog training (or any other animal training for that matter). Please, never, ever smack, shout at or shake your puppy. It will not solve the problem and may lead to issues later in his life. ^ – A house line is a long, light lead that the puppy can drag around behind him.